The companies have signed a multi-year but non-exclusive deal. The device will be selling at standar $199 for the 16GB and $299 for 32GB. iPhone 4 on Verizon will include new Personal Hotspot capabilities allowing customers to use iPhone 4 to connect up to five Wi-Fi enabled devices. 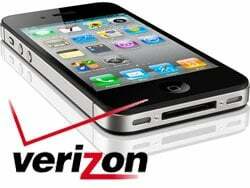 The phone works on Verizon 3G (EV-DO) only – 4G data or GSM roaming will not be available. “We are pleased to introduce millions of wireless users to the industry leading iPhone 4 on the nation’s most reliable network,” said Lowell McAdam, president and chief operating officer of Verizon. “This is an important step for the industry as two great companies join forces to give wireless customers one of the most important technological additions to the mobile landscape this century,” he added. iPhone 4 features a 5 megapixel camera with LED flash, HD video recording, Apple’s A4 chip, a 3-axis gyro and a glass and stainless steel design. iPhone 4 also comes with iOS 4, which includes multitasking, folders, Game Center, AirPlay and AirPrint wireless printing.